Crack a frosty one and prepare to laugh, it's time for another Light Grey Game Night! Mark your calendar for Saturday, June 7 from 7 to 9 PM! That's right, Saturday! 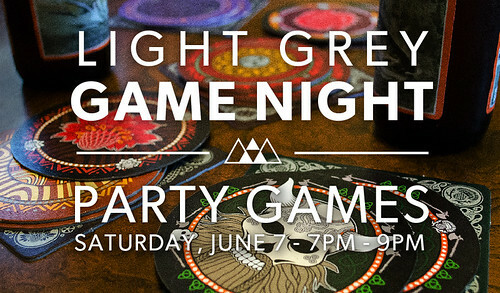 This game night is a little different because we're hosting it in tandem with Maker's Market, an annual Whittier neighborhood Art Crawl! Light Grey Art Lab is participating in the event, giving dozens of local artists a venue to show their sweet stuff. And afterwards, we're all going to play some games! As you might remember, we're attaching a theme to each night to help people narrow down what games they might want to bring (although you're still welcome to bring whatever you'd like!). Since this game night is on a Saturday night after a long day of art-crawlin', what better theme than PAR-TAY games?! We will be playing social bluffing games like Skulls & Roses and Mascarade, laugh-out-loud funny games like Say Anything, and who knows? We might even get a little physical with a game of Twister! If you have a favorite party game, bring it!